Our trip to the capital of the Czech Republic Prague took place during the last week of March, however, judging by the weather, it could have been December just as well. During those three days in Prague, we've seen more snow than through the whole winter. Sudden changes of weather conditions didn't prevent us from completing our task and we've divided our bookstore checklist into two days. (Yes, in order to use our time efficiently we actually prepare a list of the bookstores we wish to visit before we arrive to our destination... There's still some space for spontaneous discoveries tho...) We already had three bookstores in our Guide listed under Prague, so we decided to check those out first. Our first stop was at the bookstore bearing the famous name of William Shakespeare - Shakespeare and Sons. This bookstore can be found in two locations in Prague. We visited the one positioned quite far from the center of the city in Krymska street. The interior of the store is divided into two parts, the front room serves as a cafe, the backroom is dedicated to books. The whole place is very stylish and cozy but it was the sight of the pony bike neatly arranged in the sunlight that stuck in our heads. The selection of books, both new and second-hand was very promising from the first sight. The amount of books on offer is not breath-taking, but the selection itself is very interesting and it covers many topics. Wooden floors, high ceiling, used books mixed with the new ones in tall wooden shelves, Shakespeare and Sons is a place we liked. Our enthusiasm slightly dropped after opening the books, since the prices turned out to be somewhat an unpleasant surprise. Not that we wouldn't be prepared for a different price standard, after all, Prague is Prague. But even the second hand titles were priced at 150 CZK (6Euro) or more. Our next stop was the Globe bookstore and Cafe. Before entering, we were warned by a man who was standing in front of the entrance that it was not working. Once we got in, we've been told that the cafe is closed for the day due to some reconstruction work, but the bookstore is working. The books occupy most of the ground floor and also a small upstairs space. There is a counter which looks like a bar, computers to your left and lots good of books. Be sure to check out the window display before you enter, we spotted several interesting titles there. Globe also offers latest English magazines and newspapers, but you can also browse through older issues of the New Yorker. Too bad we couldn't check out the cafe, because we really needed a rest at that point of the day. In the end we decided to leave the remaining bookstores for the following day. We would also like to mention the Kafka bookstore located next to the Mucha museum right on Staroměstské náměstí, the famous square in Prague permanently occupied by tourists. Unsurprisingly, it's the name of Franz Kafka that makes this bookstore stand out. The works of this genius are laid out on one long shelf stretching practically through the whole store and you can find all his celebrated and even less-known titles in English, German and even French. Definitely a must see for anyone who considers himself/herself a Kafka reader. The Big Ben bookshop was the only one that wasn't listed in the Guide prior to our visit. We both agreed that the impression this place made upon us can be best formulated as "family atmosphere". The bookstore is rather small and during our visit it seemed to us that all the people who were there knew each other already and if someone got there for the first time, he was involved in some conversation within the next few minutes. Along with the fact that the books are concentrated on a limited space, it made the overall atmosphere very friendly. Big Ben bookshop is a nice drop-in-to-say-hi whenever you're around and pick a book from time to time place. They managed to use the available space in a very nice way - maintain a selection of books that can be described as more than decent and not to cram the space at any price. The Anagram bookshop is located only a few streets away from Big Ben but its atmosphere is completely different. It took us a while to find Anagram and when we finally spotted it, we were more than surprised to find out that we have actually already been there last year in May, few months before the idea of the Bookstore Guide was born. This event can serve as a proof of several facts (that we've seen too many bookstores by now to remember each and every one of them, or that we're getting old and senile maybe, or perhaps something else...) We really liked Anagram. It has a small second hand section in a separate room, and the main room looks like a bookmarket alley - very browsing-friendly. The selection of books ranks Anagram very high, especially the offer of non fiction (psychology, philosophy, political science and history, but also art to be more specific) was exquisite, in our opinion the best in Prague. No need to mention the question of high prices, since that is common for all the bookstores we found in Prague, although the second hand section in Anagram did have some cheaper titles on offer. You certainly won't have any serious trouble searching for a specific English title in Prague. Ticking Prague off our list also meant completing the capitals of the four Central European countries (reports from Poland and Hungary have already been posted and since half of our team is from Bratislava, Slovakia, we were only lacking Prague) and since these countries also share a common past behind the Iron curtain, we thought of putting together a separate Top 5 in the near future. Thanks for all the info! Your blog is wonderful! Thanks for all the info! Wednesday I'm off on holiday, and I'll be visiting Prague, Bratislava, Madrid, Vienna and Budapest, and, when I'm in a different country, I always buy a book in the language of that country... I was wondering if those bookstores mentioned in this article (Shakespeare and Sons in particular) only offer books in English, or if I can get books in Czech there, too? In Antikvariat Kant you could. The rest are English and Anagram doesn't work any more. 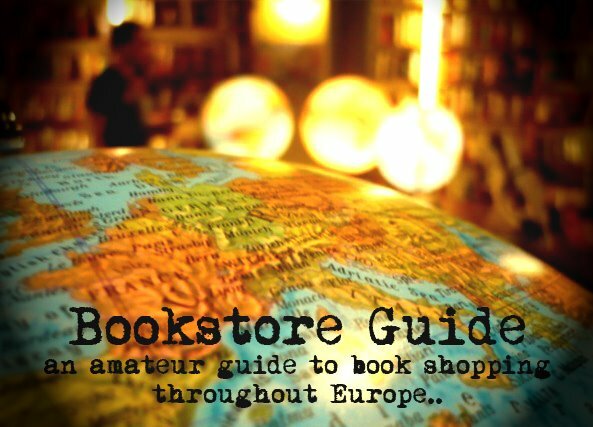 But I'm sure you'll stumble upon various Check language bookstores throughout the city.